This professional pinpointer is a handheld metal detector with high sensitivity. It can detect with high sensitivity for improved detection of small targets indoors, outdoors, on sand, on lawn, in soil to find gold. It also can detect various types of metal object, such as coin, gold, silver, relics, jewelry, etc. Versatile and easy to use, small and exquisite. 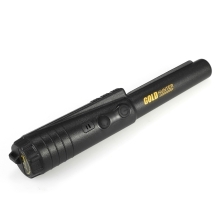 Automatic tuning without adjustment and high sensitivity with LED flashlight, audio and vibrate alert. 360° side-scan detection area with 3 alert models of audio, vibration or audio and vibration. Alarm sound will be increased based on targets&apos; proximity. Scraping blade for searching among tight soil. Small size pinpointer with holster, ultra portable and convenient. Two buttons operation for quickly turning on the detection, without having to step through multiple sensitivity settings. Note: The parts above the button are not waterproof, so this pinpointer should not be used directly underwater, or its accuracy and functions may be influenced. Detection Tip Length: 106mm / 4.17"